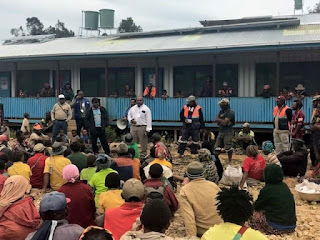 ExxonMobil PNG Limited, operator of PNG LNG, has led a team of emergency assessment and relief personnel in a visit to the earthquake affected area near the Hides Gas Conditioning Plant in the Hela Province. The team of 10 made one of the first visits possible to the area since the earthquake. On board the ExxonMobil PNG chartered helicopter were company representatives, disaster assessors from international aid agencies and representatives of relief organisations including international church groups.